Hidden in Plain Sight tells the story of one town – Litchfield, Connecticut – through an exploration of its cultural landscape: monuments, markers, signs, old roadbeds, and other footprints of the past. Suggestions or ideas for future posts are always welcome! A wonderful blog, looking forward to exploring your site. The town of Warren has some hidden gems of history you might like to check out when you do your presentation there. I’m happy to have found your blog and enjoy your discoveries. Don’t forget to visit the Red School House, Charlie Finney’s memorial, also there is(was) a tunnel that went between the Rooster Tail B&B underground to the house across the street, which I always heard was used for the Underground Railroad, also in the old Warren Center cemetery is a gravestone in memory of a child slave know as “Ned” put there by his owner. I’d love to know more about these history’s as Warren has been a drive-through town, yet it’s history helped shape America, like so much of Litchfield County. Oh don’t forget to look into bullets made from the John Bull statue that once stood in NYCity. It’s a favorite Litchfield story of mine. Thanks! These are great ideas. Can you tell me where the Finney memorial is? I have another mystery that does involve the Litchfield poor house or farm. On the 1860 census a orphan is listed at 3 years old. They have his full name listed, Henry Ebenezer Clark. Someone has to have known the family of this child if they have his name right? YDNA proves that he is indeed a Clark son. He matches my dad’s direct ancestral line of Clark’s which have been traced to John Clark of New Haven, CT b. 1637 and d. 1719 in West Haven. According to your book, the town should have asked family to support the boy, so I believe there should be some record of who it could be? I am in California, but would love to find out where these records could be? County courthouse? Historical Society? Thanks for your help. Christine, I would love to connect with you. I’m a descendent of that Henry Ebenezer Clark! He was my father’s grandfather. After decades of research he remains quite a mystery. My dad had his YDNA tested and that’s how I learned that our Henry was indeed a “Clark”. I’ve been unable to locate any records of the Town Farm in Hartford or Litchfield. My cousin and I have some theories about Henry’s ancestry, which I’d be happy to share. Please email me at lcmurray926@gmail.com. Peter, I’m so delighted to discover your books and this blog! I too am searching for ancestors who lived in Litchfield County poor houses/town farms. If you do have any tips on finding records from the Litchfield Town Farm from the 1850-1870 timeframe I would be incredibly appreciative, as my great-grandfather, Henry Ebenezer Clark, was living as an orphan in the town farm at about the age of 3 in 1860. By the 1870 census, at the age of 14, he was living on the farm of an Ira Emmons. My great-great-grandmother was living in the New Milford Poor House, and census records say she was “possessed of the devil”. Poor thing. Her daughter, Emma Evitts, my great-grandmother, went on live in the home of the, prominent I believe, Buck family in New Milford, and eventually married Henry Ebenezer Clark. Do you have any tips of finding the records of the New Milford Poor House? Wow! That’s quite a story. 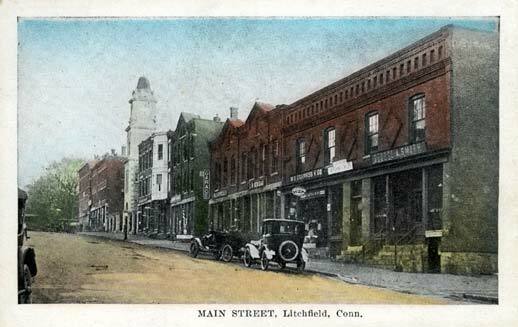 I would suggest contacting Linda Hocking at the Litchfield Historical Society about the Litchfield Town Farm. However, since that was an enterprise run by the town it is possible that the records are with the town clerk. The same would go for New Milford. Good luck! Hi Peter, thank you for your response! Could you possibly put me in touch with “Christine” who posted above on June 27, 2015? She is also researching Henry Ebenezer Clark, my great-grandfather. Thank you so much — I would really appreciate it! I was wondering if you ever came across any information regarding Elisha Taylor? His wife’s name was Lydia (Cook) and he was the son of Joel Taylor and Eleanor (Goodell). The only other thing I really know about him, is that he fought in the Revolutionary War. I am his descendant via his son Elisha, who moved to Hiram, Ohio in 1818. Nothing yet … will keep my eyes out! Thanks! I would appreciate that greatly! I know my ancestors brother and sister stayed in CT (the brother was Phineas Taylor and the sister was Polly…I believe she married into the Judson family). I believe there were a couple other siblings, but he didn’t seem to stay in contact with them…or at least none of the letters have survived. I am also descended from Elisha Tayor of Hiram, OH through his only daughter, Nancy Jane who married my grandfather Edward White. After the Civil War they settled in Winterset, IA and are buried in the Primitive Baptist Cemetery there. You must be descended from my gr. uncle Benjamin Taylor, Elisha’s son. If you dig in there you will find that one of our ancestors is Matthew Grant, The Recorder of the Connecticut witch trials. Nice to meet you Frank! Correct, Benjamin Taylor is my great great great grandfather. My grandfather was the son of his son Carl. I did not know there were any Taylors in Iowa; I grew up in Ohio, not far from Hiram, but now currently live in Wyoming. Thank you for the link and the interesting information! Frank, I mentioned you to a cousin of mine, who is into genealogy, he would like to get a hold of you. What would be the best way to do that? Nice to meet you also Christian. If you or your cousin want to contact me, try ftwhite@frontiernet.net I live in California. *Note the double “net” on the email. d the Milestone article recently regarding Judge Jedediah Strong’s marker milestone. Unfortunately for all his stature and knowledge, his death was sad. I signed up to your site and will look forward to receiving more interesting material about your town. thanks for your excellent blog and historical research. I am researching the history of Florence Chandler Maybrick in Connecticut and wondering if you have done any research on her. Such a fascinating character. I am trying to locate possible interviewees with firsthand or family experiences of Florence, in addition to artifacts from her house on Old Stone Road. Hello! Thanks for the kind words. No, I have not done any research on her, but having just read a bit, I think I will try to find her grave in South Kent. If I hear of anyone, I’ll pass the name along to you.